Auto accidents can wreak havoc on your life. Property damage, serious injuries, and even death can leave you frustrated, traumatized, feeling helpless and at wits end. McMahon, Kublick, PC has motor vehicle and car accident lawyers who help car accident injury victims and their family members through the ordeal that follows a serious car crash. Clients value our one-on-one attention and the care we use to address every detail of your situation. Motor vehicle accidents are the most common personal injury cases. In New York, car accident victims generally have two avenues of recovery — no-fault insurance claims and personal injury lawsuits. A no-fault claim is automatic. The insurance policy of the vehicle you were traveling in at the time of the accident pays the benefits, regardless of fault — even if the other driver ran a red light, drove drunk, or broke other traffic laws. If a pedestrian is hit by a motor vehicle, no-fault benefits are paid by the insurance of the car involved. New York’s no-fault law does not apply to motorcycle accidents. No-fault benefits primarily pay for lost wages, usually 80 percent of your gross pay up to $2,000 a month, and medical bills related to the accident. The minimal car insurance policy in New York State covers up to $50,000 in no-fault benefits. To obtain no-fault benefits, it is imperative that a no-fault application be filled out and received by the insurance company within 30 days of the accident. If the 30-day deadline is missed, the insurance company is not required to pay and often denies benefits. No-fault payments typically do not affect insurance premiums. The second avenue of recovery that can arise out of a motor vehicle accident is a personal injury lawsuit against the person at fault. This is a claim to compensate the injured person for pain and suffering, medical bills, and/or lost wages that exceed the $50,000 no-fault limit. To have a valid claim for personal injuries in a motor vehicle accident in New York, the other driver must have caused or contributed to the accident, and the victim must have sustained a serious injury. The definition of a serious injury ranges from death to a fracture. Our qualified Syracuse car accident attorneys can help determine if your injury qualifies as serious under the law. 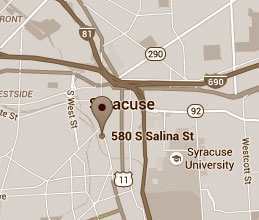 Syracuse Car Accident Lawyers: How We Can Help. Our experience and thorough auto accident case preparation allows us to vigorously prosecute your car accident case and maximize your recovery in your case. McMahon, Kublick, PC is one of the most respected personal injury law firms in Syracuse and Central New York. We concentrate in all types of serious personal injury cases including car accidents, motorcycle accidents, nursing home, medical malpractice, unsafe property, wrongful death, workers compensation and social security disability cases. Our Syracuse personal injury lawyers are dedicated to protecting the rights of clients who have been seriously injured through the wrongful or negligent actions of others. If you would like to talk to a Syracuse car accident lawyer about your potential case, please call us toll free at (800) 638-2998. You may also use one of our convenient online contact forms and one of our attorneys will call you at a time that is convenient for you. All consultations are FREE, and you never have to pay a fee unless your case is successful.